Motor learning: faded feedback schedule (continuous to results/summary-based), while progressing demands of a movement over time. Think of your body like an emergency room; the highest priority health issue gets the most attention. In other words, if you are having a heart attack, fat loss is not your body's priority. Instead, your body is focused on survival. 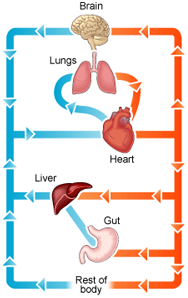 I call this Body Systems Prioritization (BSP). A heart attack is a pretty easy example to understand, but eating a bag of candy that triggers a massive insulin response -- slowly harming our pancreas with every spike -- doesn't register as a bad idea when it comes to fat loss. Please understand your endocrine system -- which is responsible for the pancreas -- is a higher priority for your body than losing fat. So, if you challenge your endocrine system, you are shifting focus away from fat loss. In order to lose fat, it's important you take care of all higher priority health issues first, albeit a digestive concern after a lousy meal, a handful of sprints to battle off excess sugar you consumed, or a couple months focused on improving heart health by reducing high blood pressure, cholesterol, and triglycerides. Think about fat loss strategically by focusing on your body's highest priority health concern first. A lot of people make the mistake of doing cardio for fat loss; while traditional cardio has benefits related to stress reduction, inflammation reduction, etc., it's not the most effective way to lose fat. Also, machine-based cardio (ellipticals, treadmills, etc.) should be used with caution, as they tend to place your body in an artificial position and force it to exercise awkwardly. Instead, consider shifting your exercise 'mode' to bodyweight or weight-based resistance training. Your bodyweight is typically all it takes to reach momentary muscular failure (MMF). MMF is what dictates results. When you hit MMF, your body is forced to undergo a repair process, consuming oxygen and burning calories. This is known as EPOC, or Excess Post-execise Oxygen Consumption. One of the best ways to spike your metabolism in a fat loss workout is by combining exercises into a single set. When you combine two exercises into one set, this is called a superset; similarly, when you combine 3-5 it's called a giant set. When you combine all exercises within a given workout into a single set, this is referred to as circuit training. By stacking exercises into supersets, giant sets, and circuits, you are loading your muscles, spiking your metabolism, and then resting. By alternating between lower and higher intensities, you'll be able to get more from every rep of every set you do. Over the years, we've noticed our clients get the best results by choosing one exercise from each category above and then doing all five exercises back-to-back, as a single set. Typically, we recommend you emphasize 'squat' and 'push' on the same days, and similarly 'lunge' and 'pull'. 'Planks' emphasize your core, so we train that intensely on every workout. Days 1, 3: Emphasize squat, push, and plank by choosing harder exercises or heavier weights and lower reps.
Days 2, 4: Emphasize lunge, pull, and plank by choosing harder exercises or heavier weights and lower reps. The fastest way to learn an exercise is by using a faded feedback schedule. This means you'll want to have constant and continuous feedback on form and intensity in the beginning. Ideally, this involves a spotter or workout partner, along with a full-body mirror so you can check your own form. Over time, you'll want to lessen the amount of feedback you're getting and move towards assessing your performance at the end of every set... and, eventually, at the end of every workout. This is called summary-based feedback, and it's a necessary step to teach your body how to move on its own, without spotting or cueing from another person. After six weeks of performing a movement correctly a "plastic" change takes place in your nervous system, which means you now have an actual physical representation of this movement imprinted into your movement memory. Plasticity means you gain coordination, and coordination means you gain strength with movement. Naturally, you get faster results when you're able to get the full benefit from an exercise, rather than spend most of your energy making sure you don't mess up form or hurt yourself. "Your body will respond to any stress or demand placed upon it." This means if you ask your body to do one more rep, you'll gain endurance; if you ask your body to lift a slightly heavier weight, you'll build strength. Remember, when you're asking more of your body, it's never at the sacrifice of form. Form first, always. This is what keeps you safe, and safety is what produces long-term results; if you get hurt, you're going to rebound and lose everything you've worked so hard to gain. Rule #1: High-intensity/sprints burn sugar, and sugar destroys fat loss. Rule #5: Eat for energy. Choose foods based upon how they make you feel, for the better and more energetic you feel, the higher your metabolism will become. 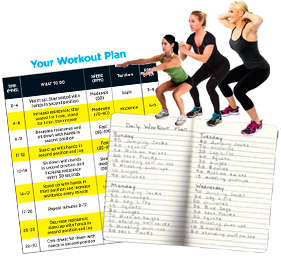 Master fat loss by learning how to properly design your own workout program. Figure out your body's highest priority, choose the best parameters for your workouts, select the best exercises and stack them together in the right order, be sure to rest frequently enough to recover and put your best effort into the next set, and fade your feedback over time. Also, be sure to watch out for form and dietary mistakes along the way! Now, this may sound like a lot to take in, and it is (at first.) So, why not let us help you? All you have to do is click 'Activate My Membership' below, and you'll instantly be given 30 days FREE in Create My Workout, where we've done all the program design for-you.